Glaucoma is a group of eye diseases which result in damage to the optic nerve and cause vision loss. The most common type is open-angle glaucoma with less common types including closed-angle glaucoma and normal-tension glaucoma. Open-angle glaucoma develops slowly over time and there is no pain. 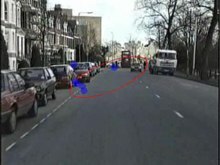 Peripheral vision may begin to decrease followed by central vision resulting in blindness if not treated. Closed-angle glaucoma can present gradually or suddenly. The sudden presentation may involve severe eye pain, blurred vision, mid-dilated pupil, redness of the eye, and nausea. Vision loss from glaucoma, once it has occurred, is permanent. Acute angle closure glaucoma of the person's right eye (shown at left). Note the mid-sized pupil, which was non-reactive to light, and redness of the white part of the eye. About 6 to 67 million people have glaucoma globally. The disease affects about 2 million people in the United States. It occurs more commonly among older people. Closed-angle glaucoma is more common in women. Glaucoma has been called the "silent thief of sight" because the loss of vision usually occurs slowly over a long period of time. Worldwide, glaucoma is the second-leading cause of blindness after cataracts. The word "glaucoma" is from Ancient Greek glaukos which means blue, green, or gray. In English, the word was used as early as 1587 but did not become commonly used until after 1850, when the development of the ophthalmoscope allowed people to see the optic nerve damage. 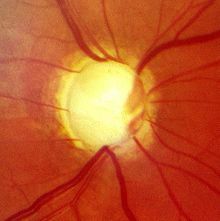 Other factors can cause glaucoma, known as "secondary glaucoma", including prolonged use of steroids (steroid-induced glaucoma); conditions that severely restrict blood flow to the eye, such as severe diabetic retinopathy and central retinal vein occlusion (neovascular glaucoma); ocular trauma (angle-recession glaucoma); and inflammation of the middle layer of the pigmented vascular eye structure (uveitis), known as uveitic glaucoma. The underlying cause of open-angle glaucoma remains unclear. Several theories exist on its exact etiology. However, the major risk factor for most glaucomas and the focus of treatment is increased intraocular pressure. Intraocular pressure is a function of production of liquid aqueous humor by the ciliary processes of the eye, and its drainage through the trabecular meshwork. Aqueous humor flows from the ciliary processes into the posterior chamber, bounded posteriorly by the lens and the zonules of Zinn, and anteriorly by the iris. It then flows through the pupil of the iris into the anterior chamber, bounded posteriorly by the iris and anteriorly by the cornea. From here, the trabecular meshwork drains aqueous humor via the scleral venous sinus (Schlemm's canal) into scleral plexuses and general blood circulation. Owing to the sensitivity of all methods of tonometry to corneal thickness, methods such as Goldmann tonometry should be augmented with pachymetry to measure the central corneal thickness (CCT). A thicker-than-average cornea can result in a pressure reading higher than the 'true' pressure whereas a thinner-than-average cornea can produce a pressure reading lower than the 'true' pressure. Because pressure measurement error can be caused by more than just CCT (i.e., corneal hydration, elastic properties, etc. ), it is impossible to 'adjust' pressure measurements based only on CCT measurements. The frequency doubling illusion can also be used to detect glaucoma with the use of a frequency doubling technology perimeter. Perimetry (visual field test) Complete field of vision No No The patient looks straight ahead and is asked to indicate when light passes the patient's peripheral field of vision. This allows the examiner to map the patient's field of vision. Primary angle closure glaucoma is caused by contact between the iris and trabecular meshwork, which in turn obstructs outflow of the aqueous humor from the eye. This contact between iris and trabecular meshwork (TM) may gradually damage the function of the meshwork until it fails to keep pace with aqueous production, and the pressure rises. In over half of all cases, prolonged contact between iris and TM causes the formation of synechiae (effectively "scars"). These cause permanent obstruction of aqueous outflow. In some cases, pressure may rapidly build up in the eye, causing pain and redness (symptomatic, or so-called "acute" angle closure). In this situation, the vision may become blurred, and halos may be seen around bright lights. Accompanying symptoms may include a headache and vomiting. Toxic glaucoma is open-angle glaucoma with an unexplained significant rise of intraocular pressure following unknown pathogenesis. Intraocular pressure can sometimes reach 80 mmHg (11 kPa). It characteristically manifests as ciliary body inflammation and massive trabecular oedema that sometimes extends to Schlemm's canal. This condition is differentiated from malignant glaucoma by the presence of a deep and clear anterior chamber and a lack of aqueous misdirection. Also, the corneal appearance is not as hazy. 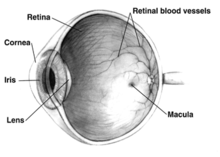 A reduction in visual acuity can occur followed neuroretinal breakdown. Less-selective alpha agonists, such as epinephrine, decrease aqueous humor production through vasoconstriction of ciliary body blood vessels, useful only in open-angle glaucoma. Epinephrine's mydriatic effect, however, renders it unsuitable for closed-angle glaucoma due to further narrowing of the uveoscleral outflow (i.e. further closure of trabecular meshwork, which is responsible for absorption of aqueous humor). A newer type of laser trabeculoplasty uses a "cold" (nonthermal) laser to stimulate drainage in the trabecular meshwork. This newer procedure, selective laser trabeculoplasty (SLT), uses a 532-nm, frequency-doubled, Q-switched Nd:YAG laser, which selectively targets melanin pigment in the trabecular meshwork cells. Studies show SLT is as effective as ALT at lowering eye pressure. In addition, SLT may be repeated three to four times, whereas ALT can usually be repeated only once. Canaloplasty is a nonpenetrating procedure using microcatheter technology. To perform a canaloplasty, an incision is made into the eye to gain access to the Schlemm's canal in a similar fashion to a viscocanalostomy. A microcatheter will circumnavigate the canal around the iris, enlarging the main drainage channel and its smaller collector channels through the injection of a sterile, gel-like material called viscoelastic. The catheter is then removed and a suture is placed within the canal and tightened. Ab interno implants, such as the Xen Gel Stent, are transscleral implants by an ab interno procedure to channel aqueous humor into the non-dissected Tenon's space, creating a subconjunctival drainage area similar to a bleb. The implants are transscleral and different from more other ab interno implants that do not create a transscleral drainage, such as iStent, CyPass, or Hydrus. Nonpenetrating deep sclerectomy (NPDS) surgery is a similar, but modified, procedure, in which instead of puncturing the scleral bed and trabecular meshwork under a scleral flap, a second deep scleral flap is created, excised, with further procedures of deroofing the Schlemm's canal, upon which, percolation of liquid from the inner eye is achieved and thus alleviating intraocular pressure, without penetrating the eye. NPDS is demonstrated to have significantly fewer side effects than trabeculectomy. However, NPDS is performed manually and requires higher level of skills that may be assisted with instruments. In order to prevent wound adhesion after deep scleral excision and to maintain good filtering results, NPDS as with other non-penetrating procedures is sometimes performed with a variety of biocompatible spacer or devices, such as the Aquaflow collagen wick, ologen Collagen Matrix, or Xenoplast glaucoma implant. The association of elevated intraocular pressure (IOP) and the eye disease glaucoma was first described by Englishman Richard Bannister in 1622: "...that the Eye be grown more solid and hard, then naturally it should be...". Angle-closure glaucoma was treated with cataract extraction by John Collins Warren in Boston as early as 1806. The invention of the ophthalmoscope by Hermann Helmholtz in 1851 enabled ophthalmologists for the first time to identify the pathological hallmark of glaucoma, the excavation of the optic nerve head due to retinal ganglion cell loss. The first reliable instrument to measure intraocular pressure was invented by Norwegian ophthalmologist Hjalmar August Schiøtz in 1905. About half a century later, Hans Goldmann in Berne, Switzerland, developed his applanation tonometer which still today - despite numerous new innovations in diagnostics - is considered the gold standard of determining this crucial pathogenic factor. In the late 20th century, further pathomechanisms beyond elevated IOP were discovered and became the subject of research like insufficient blood supply – often associated with low or irregular blood pressure – to the retina and optic nerve head. The first drug to reduce IOP, pilocarpine, was introduced in the 1870s. 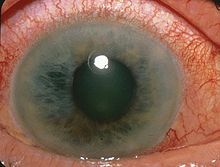 Early surgical techniques like iridectomy and fistulating methods have recently been supplemented by less invasive procedures like small implants, a range of options now widely called MIGS (micro-invasive glaucoma surgery). The word "glaucoma" comes from the Ancient Greek γλαύκωμα, a derivative of γλαυκóς, which commonly described the color of eyes which were not dark (i.e. blue, green, light gray). Eyes described as γλαυκóς due to disease might have had a gray cataract in the Hippocratic era, or, in the early Common Era, the greenish pupillary hue sometimes seen in angle-closure glaucoma. ^ a b c d e f g h i j k l m n o "Facts About Glaucoma". National Eye Institute. Archived from the original on 28 March 2016. Retrieved 29 March 2016. ^ Ferri, Fred F. (2010). Ferri's differential diagnosis : a practical guide to the differential diagnosis of symptoms, signs, and clinical disorders (2nd ed.). Philadelphia, PA: Elsevier/Mosby. p. Chapter G. ISBN 978-0323076999. ^ Mi, Xue-Song; Yuan, Ti-Fei; So, Kwok-Fai (16 September 2014). "The current research status of normal tension glaucoma". Clinical Interventions in Aging. 9: 1563–71. doi:10.2147/CIA.S67263. PMC 4172068. PMID 25258525. ^ a b Vass, C.; Hirn, C.; Sycha, T.; Findl, O.; Bauer, P.; Schmetterer, L. (17 October 2007). "Medical interventions for primary open angle glaucoma and ocular hypertension". The Cochrane Database of Systematic Reviews (4): CD003167. doi:10.1002/14651858.CD003167.pub3. ISSN 1469-493X. PMID 17943780. ^ "Glaucoma: The 'silent thief' begins to tell its secrets" (Press release). National Eye Institute. 21 January 2014. Archived from the original on 23 July 2015. ^ Resnikoff, Serge; Pascolini, Donatella; Etya'Ale, Daniel; Kocur, Ivo; Pararajasegaram, Ramachandra; Pokharel, Gopal P.; Mariotti, Silvio P. (2004). "Global data on visual impairment in the year 2002". Bulletin of the World Health Organization. 82 (11): 844–51. doi:10.1590/S0042-96862004001100009 (inactive 24 March 2019). PMC 2623053. PMID 15640920. Archived from the original on 12 December 2013. ^ a b Leffler, CT; Schwartz, SG; Giliberti, FM; Young, MT; Bermudez, D (2015). "What was Glaucoma Called Before the 20th Century?". Ophthalmology and Eye Diseases. 7: 21–33. doi:10.4137/OED.S32004. ISSN 1179-1721. PMC 4601337. PMID 26483611. Archived from the original on 23 April 2016. ^ Leffler CT, Schwartz SG, Stackhouse R, Davenport B, Spetzler K (2013). "Evolution and impact of eye and vision terms in written English". JAMA Ophthalmology. 131 (12): 1625–31. doi:10.1001/jamaophthalmol.2013.917. PMID 24337558. Archived from the original on 23 December 2014. ^ Wang N, Wu H, Fan Z (November 2002). "Primary angle closure glaucoma in Chinese and Western populations". Chinese Medical Journal. 115 (11): 1706–15. PMID 12609093. Archived from the original on 21 December 2016. ^ Dorairaj, Syril; Tsai, James C.; Grippo, Tomas M. (2012). "Changing Trends of Imaging in Angle Closure Evaluation". ISRN Ophthalmology. 2012: 597124. doi:10.5402/2012/597124. PMC 3914273. PMID 24558589. ^ Cheng, JW; Zong, Y; Zeng, YY; Wei, RL (2014). "The prevalence of primary angle closure glaucoma in adult Asians: a systematic review and meta-analysis". PLOS One. 9 (7): e103222. doi:10.1371/journal.pone.0103222. PMC 4110010. PMID 25057993. ^ Friedman D, Vedula SS (2006). "Lens extraction for chronic angle-closure glaucoma". Cochrane Database of Systematic Reviews. 3 (3): CD005555. doi:10.1002/14651858.CD005555.pub2. PMC 4438535. PMID 16856103. ^ Fernández-Martínez, Lorena; Letteboer, Stef; Mardin, Christian Y.; Weisschuh, Nicole; Gramer, Eugen; Weber, Bernhard Hf; Rautenstrauss, Bernd; Ferreira, Paulo A.; Kruse, Friedrich E. (April 2011). "Evidence for RPGRIP1 gene as risk factor for primary open angle glaucoma". European Journal of Human Genetics. 19 (4): 445–451. doi:10.1038/ejhg.2010.217. ISSN 1476-5438. PMC 3060327. PMID 21224891. ^ Pardianto G, et al. (2005). "Aqueous Flow and the Glaucoma". Mimbar Ilmiah Oftalmologi Indonesia. 2: 12–15. ^ Chaum E, et al. "A 5-year-old girl who failed her school vision screening. Case presentation of Persistent fetal vasculature (PFV), also called persistent hyperplastic primary vitreous (PHPV)". Digital Journal of Ophthalmology. Archived from the original on 11 January 2009. ^ Hunt A, Rowe N, Lam A, Martin F (July 2005). "Outcomes in persistent hyperplastic primary vitreous". Br J Ophthalmol. 89 (7): 859–63. doi:10.1136/bjo.2004.053595. PMC 1772745. PMID 15965167. ^ Chang B, Smith RS, Peters M, et al. (2001). "Haploinsufficient Bmp4 ocular phenotypes include anterior segment dysgenesis with elevated intraocular pressure". BMC Genet. 2: 18. doi:10.1186/1471-2156-2-18. PMC 59999. PMID 11722794. ^ Alguire P (1990). "The Eye Chapter 118 Tonometry>Basic Science". In Walker HK, Hall WD, Hurst JW (eds.). Clinical methods: the history, physical, and laboratory examinations (3rd ed.). London: Butterworths. ISBN 978-0-409-90077-4. ^ Mozaffarieh M, Grieshaber MC, Flammer J (2008). "Oxygen and blood flow: players in the pathogenesis of glaucoma". Mol. Vis. 14: 224–33. PMC 2267728. PMID 18334938. Archived from the original on 9 June 2008. ^ Osborne NN, Wood JP, Chidlow G, Bae JH, Melena J, Nash MS (August 1999). "Ganglion cell death in glaucoma: what do we really know?". Br J Ophthalmol. 83 (8): 980–6. doi:10.1136/bjo.83.8.980. PMC 1723166. PMID 10413706. ^ Levin LA, Peeples P (February 2008). "History of neuroprotection and rationale as a therapy for glaucoma". Am J Manag Care. 14 (1 Suppl): S11–4. PMID 18284310. Archived from the original on 7 April 2012. ^ Varma R, Peeples P, Walt JG, Bramley TJ (February 2008). "Disease progression and the need for neuroprotection in glaucoma management". Am J Manag Care. 14 (1 Suppl): S15–9. PMID 18284311. Archived from the original on 7 April 2012. ^ Hernández M, Urcola JH, Vecino E (May 2008). "Retinal ganglion cell neuroprotection in a rat model of glaucoma following brimonidine, latanoprost or combined treatments". Exp. Eye Res. 86 (5): 798–806. doi:10.1016/j.exer.2008.02.008. PMID 18394603. ^ Cantor LB (December 2006). "Brimonidine in the treatment of glaucoma and ocular hypertension". Ther Clin Risk Manag. 2 (4): 337–46. doi:10.2147/tcrm.2006.2.4.337. PMC 1936355. PMID 18360646. ^ Schwartz M (June 2007). "Modulating the immune system: a vaccine for glaucoma?". Can J Ophthalmol. 42 (3): 439–41. doi:10.3129/I07-050. PMID 17508041. ^ Morrison JC (2006). "INTEGRINS IN THE OPTIC NERVE HEAD: POTENTIAL ROLES IN GLAUCOMATOUS OPTIC NEUROPATHY (AN AMERICAN OPHTHALMOLOGICAL SOCIETY THESIS)". Trans Am Ophthalmol Soc. 104: 453–77. PMC 1809896. PMID 17471356. ^ Knox DL, Eagle RC, Green WR (March 2007). "Optic nerve hydropic axonal degeneration and blocked retrograde axoplasmic transport: histopathologic features in human high-pressure secondary glaucoma". Arch. Ophthalmol. 125 (3): 347–53. doi:10.1001/archopht.125.3.347. PMID 17353405. ^ Tezel G, Luo C, Yang X (March 2007). "Accelerated Aging in Glaucoma: Immunohistochemical Assessment of Advanced Glycation End Products in the Human Retina and Optic Nerve Head". Invest. Ophthalmol. Vis. Sci. 48 (3): 1201–11. doi:10.1167/iovs.06-0737. PMC 2492883. PMID 17325164. ^ Berry FB, Mirzayans F, Walter MA (April 2006). "Regulation of FOXC1 stability and transcriptional activity by an epidermal growth factor-activated mitogen-activated protein kinase signaling cascade". J Biol Chem. 281 (15): 10098–104. doi:10.1074/jbc.M513629200. PMID 16492674. ^ "Issue on neuroprotection". Can. J. Ophthalmol. 42 (3). June 2007. ISSN 1715-3360. Archived from the original on 12 May 2007. ^ Farandos, NM; Yetisen, AK; Monteiro, MJ; Lowe, CR; Yun, SH (November 2014). "Contact Lens Sensors in Ocular Diagnostics". Advanced Healthcare Materials. 4 (6): 792–810. doi:10.1002/adhm.201400504. PMID 25400274. ^ Thomas R, Parikh RS (September 2006). "How to assess a patient for glaucoma". Community Eye Health. 19 (59): 36–7. PMC 1705629. PMID 17491713. ^ Michelessi M, Lucenteforte E, Oddone F, Brazzelli M, Parravano M, Franchi S, Ng SM, Virgili G (2015). "Optic nerve head and fibre layer imaging for diagnosing glaucoma". Cochrane Database Syst Rev. 11 (11): CD008803. doi:10.1002/14651858.CD008803.pub2. PMC 4732281. PMID 26618332. ^ Foundation, G. R. (n.d.). "Five common Glaucoma Tests". Glaucoma.org. Archived from the original on 8 September 2017. Retrieved 20 February 2014. ^ "Nerve Fiber Analysis". Glaucoma Associates of Texas. White Rabbit Communications, Inc. 2010. Archived from the original on 26 March 2013. Retrieved 9 December 2012. ^ Paton D, Craig JA; Craig (1976). "Glaucomas. Diagnosis and management". Clin Symp. 28 (2): 1–47. PMID 1053095. ^ a b "Primary Open-Angle Glaucoma: Glaucoma: Merck Manual Professional". Merck.com. Archived from the original on 28 November 2010. Retrieved 24 January 2011. ^ Simha A, Braganza A, Abraham L, Samuel P, Lindsley K (2013). "Anti-vascular endothelial growth factor for neovascular glaucoma". Cochrane Database Syst Rev. 10 (10): CD007920. doi:10.1002/14651858.CD007920.pub2. PMC 4261636. PMID 24089293. ^ Arthur J. Sit, MD (23 April 2006). "Many types of glaucoma, one kind of damage to optic nerve". Chicago Tribune. Archived from the original on 6 October 2012. Retrieved 18 August 2015. Glaucoma is a broad term for a number of different conditions that damage the optic nerve, the 'cable' that carries visual information from the eye to the brain, thereby causing changes in vision. ^ Moyer, Virginia A. (9 July 2013). "Screening for Glaucoma: U.S. Preventive Services Task Force Recommendation Statement". Annals of Internal Medicine. 159 (7): I-28. doi:10.7326/0003-4819-159-6-201309170-00685. PMID 23836133. ^ "Glaucoma – National Institutes of Health". Nihseniorhealth.gov. Archived from the original on 25 December 2010. Retrieved 24 January 2011. ^ Noecker RJ (June 2006). "The management of glaucoma and intraocular hypertension: current approaches and recent advances". Ther Clin Risk Manag. 2 (2): 193–206. doi:10.2147/tcrm.2006.2.2.193. PMC 1661659. PMID 18360593. ^ Parikh RS, Parikh SR, Navin S, Arun E, Thomas R (1 May 2008). "Practical approach to medical management of glaucoma". Indian J Ophthalmol. 56 (3): 223–30. doi:10.4103/0301-4738.40362. PMC 2636120. PMID 18417824. ^ Leffler CT, Amini L (2007). "Interpretation of uniocular and binocular trials of glaucoma medications: an observational case series". BMC Ophthalmol. 7: 17. doi:10.1186/1471-2415-7-17. PMC 2093925. PMID 17916260. ^ Xu L, Wang X, Wu M (2017). "Topical medication instillation techniques for glaucoma". Cochrane Database Syst Rev. 2: CD010520. doi:10.1002/14651858.CD010520.pub2. PMC 5419432. PMID 28218404. ^ Jaret, Peter. "A New Understanding of Glaucoma". The New York Times. NYTimes.com. Archived from the original on 10 March 2014. Retrieved 20 February 2014. ^ Ritch R (June 2007). "Natural compounds: evidence for a protective role in eye disease". Can. J. Ophthalmol. 42 (3): 425–38. doi:10.3129/I07-044. PMID 17508040. ^ Tsai JC, Song BJ, Wu L, Forbes M (September 2007). "Erythropoietin: a candidate neuroprotective agent in the treatment of glaucoma". J Glaucoma. 16 (6): 567–71. doi:10.1097/IJG.0b013e318156a556. PMID 17873720. ^ Mozaffarieh M, Flammer J (November 2007). "Is there more to glaucoma treatment than lowering IOP?". Surv Ophthalmol. 52 (Suppl 2): S174–79. doi:10.1016/j.survophthal.2007.08.013. PMID 17998043. ^ Shingleton B, Tetz M, Korber N (March 2008). "Circumferential viscodilation and tensioning of Schlemm's canal (canaloplasty) with temporal clear corneal phacoemulsification cataract surgery for open-angle glaucoma and visually significant cataract: one-year results". J Cataract Refract Surg. 34 (3): 433–40. doi:10.1016/j.jcrs.2007.11.029. PMID 18299068. ^ Lewis RA, von Wolff K, Tetz M, et al. (July 2007). "Canaloplasty: circumferential viscodilation and tensioning of Schlemm's canal using a flexible microcatheter for the treatment of open-angle glaucoma in adults: interim clinical study analysis". J Cataract Refract Surg. 33 (7): 1217–26. doi:10.1016/j.jcrs.2007.03.051. PMID 17586378. ^ Dada T, Sharma R, Sinha G, Angmo D, Temkar S (2016). "Cyclodialysis-enhanced trabeculectomy with triple Ologen implantation". Eur J Ophthalmol. 26 (1): 95–7. doi:10.5301/ejo.5000633. PMID 26044372. ^ Yuan, F; Li, L; Chen; Yan; Wang (2015). "Biodegradable 3D-Porous Collagen Matrix (Ologen) Compared with Mitomycin C for Treatment of Primary Open-Angle Glaucoma: Results at 5 Years". Journal of Ophthalmology. 2015 (637537): 1–7. doi:10.1155/2015/637537. PMC 4452460. PMID 26078875. ^ a b Dada, Tanuj; Amit S; Saptorshi M; Meenakshi G (May 2013). "Combined Subconjunctival and Subscleral ologen Implant Insertion in Trabeculectomy". Eye. 27 (7): 889. doi:10.1038/eye.2013.76. PMC 3709396. PMID 23640614. ^ Cillino, S; Casuccio A; Di Pace F; Cagini C; Ferraro LL (March 2016). "Biodegradable collagen matrix implant versus mitomycin-C in trabeculectomy: five-year follow-up". BMC Ophthalmol. 16 (24): 24. doi:10.1186/s12886-016-0198-0. PMC 4779569. PMID 26946419. ^ "Eyelights Newsletter: About Glaucoma New Zealand" (PDF). Glaucoma.org. Archived (PDF) from the original on 13 January 2015. Retrieved 20 February 2014. ^ Molteno AC, Polkinghorne PJ, Bowbyes JA (November 1986). "The vicryl tie technique for inserting a draining implant in the treatment of secondary glaucoma". Aust N Z J Ophthalmol. 14 (4): 343–54. doi:10.1111/j.1442-9071.1986.tb00470.x. PMID 3814422. ^ Lewis RA (August 2014). "Ab interno approach to the subconjunctival space using a collagen glaucoma stent". J Cataract Refract Surg. 40 (8): 1301–6. doi:10.1016/j.jcrs.2014.01.032. PMID 24943904. ^ "Xen Gel Stent". AqueSys. AqueSys. Archived from the original on 29 June 2015. Retrieved 27 June 2015. ^ "Advances in Glaucoma Filtration Surgery". Glaucoma Today. Archived from the original on 29 June 2015. Retrieved 27 June 2015. ^ Rosentreter, Andre; Andre M. Schild; Sven Dinslage; Thomas S. Dietlein (January 2011). "Biodegradable implant for tissue repair after glaucoma drainage device surgery". J Glaucoma. 21 (2): 76–8. doi:10.1097/IJG.0b013e3182027ab0. PMID 21278584. ^ Rosentreter, Andre; Anne C. Mellein; Walter W. Konen; Thomas S. Dietlein (September 2010). "Capsule excision and ologenTM implantation for revision after glaucoma drainage device surgery". Graefes Arch Clin Exp Ophthalmol. 248 (9): 1319–24. doi:10.1007/s00417-010-1385-y. PMID 20405139. ^ Rosentreter, A; Mellein AC; Konen WW; Dietlein TS (2010). "Capsule excision and ologenTM implantation for revision after glaucoma drainage device surgery". Graefes Arch Clin Exp Ophthalmol. 248 (9): 1319–24. doi:10.1007/s00417-010-1385-y. PMID 20405139. ^ Pardianto G, et al. (2006). "Some difficulties on Glaucoma". Mimbar Ilmiah Oftalmologi Indonesia. 3: 49–50. ^ Chiselita, D (2001). "Non-penetrating deep sclerectomy versus trabeculectomy in primary open-angle glaucoma surgery". Eye. 15 (Pt 2): 197–201. doi:10.1038/eye.2001.60. PMID 11339590. ^ Iqbal "Ike" K. Ahmed (1 September 2005). "Making the Case for Nonpenetrating Surgery". Review of Ophthamology. 12 (9). Archived from the original on 11 October 2007. ^ Aptel, F; Dumas S; Denis P (2009). "Ultrasound biomicroscopy and optical coherence tomography imaging of filtering blebs after deep sclerectomy with new collagen implant". Eur J Ophthalmol. 19 (2): 223–30. doi:10.1177/112067210901900208. PMID 19253238. ^ Matthew, SJ; Sarkisian S; Nathan B; James MR (2012). "Initial experience using a collagen matrix implant (ologen) as a wound modulator with canaloplasty: 12 month results". Ft. Lauderdale: ARVO Congress. ^ Anisimova SY, Anisimova SI, Larionov EV (2012). "Biological drainage – Xenoplast in glaucoma surgery (experimental and 10-year of clinical follow-up)" (PDF). Copenhagen: EGS Congress. Archived (PDF) from the original on 17 October 2013. ^ Heijl, Anders; Bengtsson, Boel; Hyman, Leslie; Leske, M. Cristina (December 2009). "Natural History of Open-Angle Glaucoma". Ophthalmology (Submitted manuscript). 116 (12): 2271–76. doi:10.1016/j.ophtha.2009.06.042. PMID 19854514. ^ "Glaucoma". Coopereyecare.com. 25 July 2013. Archived from the original on 13 December 2013. Retrieved 20 February 2014. ^ "Death and DALY estimates for 2004 by cause for WHO Member States" (xls). World Health Organization. 2004. Archived from the original on 27 January 2012. ^ a b c Quigley, H A; Broman, AT (March 2006). "The number of people with glaucoma worldwide in 2010 and 2020". British Journal of Ophthalmology. 90 (3): 262–67. doi:10.1136/bjo.2005.081224. PMC 1856963. PMID 16488940. ^ Sommer, Alfred; Tielsch, James M.; Katz, Joanne; Quigley, Harry A.; Gottsch, John D.; Javitt, Jonathan C.; Martone, James F.; Royall, Richard M.; Witt, Kathe A.; Ezrine, Sandi (14 November 1991). "Racial Differences in the Cause-Specific Prevalence of Blindness in East Baltimore". New England Journal of Medicine. 325 (20): 1412–17. doi:10.1056/NEJM199111143252004. PMID 1922252. ^ "Glaucoma and Marijuana use". National Eye Institute. 21 June 2005. Archived from the original on 27 December 2009. ^ Ramulu, Pradeep (March 2009). "Glaucoma and disability: which tasks are affected, and at what stage of disease?". Current Opinion in Ophthalmology. 20 (2): 92–98. doi:10.1097/ICU.0b013e32832401a9. PMC 2692230. PMID 19240541. ^ Akbari, M.; Akbari, S.; Pasquale, L. R. (February 2009). "The Association of Primary Open-angle Glaucoma With Mortality: A Meta-analysis of Observational Studies". Archives of Ophthalmology. 127 (2): 204–10. doi:10.1001/archophthalmol.2008.571. PMID 19204241. ^ Leffler CT, et al. (2017). "Ophthalmology in North America: Early Stories (1491-1801)". Ophthalmology and Eye Diseases. 9: 1–51. doi:10.1177/1179172117721902. PMC 5533269. PMID 28804247. ^ Harper, Douglas. "glaucoma". Online Etymology Dictionary. ^ Leffler CT, Schwartz SG, Hadi TM, Salman A, Vasuki V (2015). "The early history of glaucoma: the glaucous eye (800 BC to 1050 AD)". Clinical Ophthalmology. 9: 207–15. doi:10.2147/OPTH.S77471. PMC 4321651. PMID 25673972. Archived from the original on 26 February 2015. ^ Sean K Wang, Robert T Chang (2014). "An emerging treatment option for glaucoma: Rho kinase inhibitors". Clin Ophthalmol. 8: 883–89. doi:10.2147/OPTH.S41000. PMC 4025933. PMID 24872673. ^ a b c Sena DF, Lindsley K (2017). "Neuroprotection for treatment of glaucoma in adults". Cochrane Database Syst Rev. 1: CD006539. doi:10.1002/14651858.CD006539.pub4. PMC 5370094. PMID 28122126. ^ a b "Complementary Therapy Assessment: Marijuana in the Treatment of Glaucoma". American Academy of Ophthalmology. Retrieved 4 May 2011. ^ "Complementary Therapy Assessments : American Academy of Ophthalmology". One.aao.org. Retrieved 24 January 2011. ^ Jampel H (February 2010). "American glaucoma society position statement: marijuana and the treatment of glaucoma". J. Glaucoma. 19 (2): 75–6. doi:10.1097/IJG.0b013e3181d12e39. PMID 20160576.